Mother Teresa, icon of charity and mercy, will be canonized this fall. 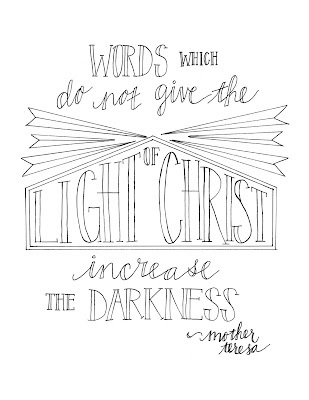 This step cements her as an example for everyone of radically living out our Christian vocations. I think that there is no better time to introduce or revisit her incredible wisdom. 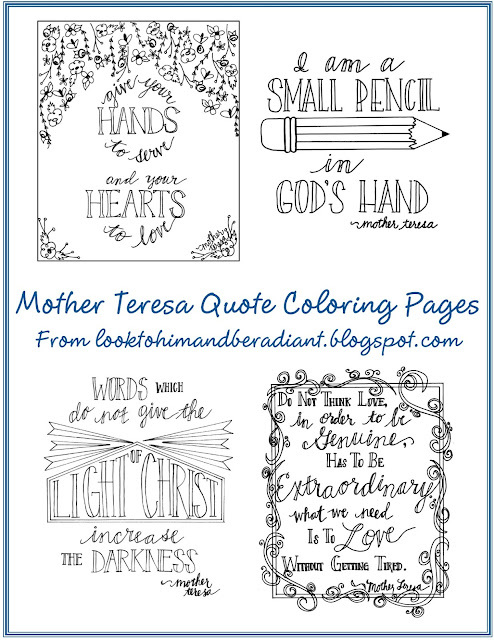 Enjoy these Mother Teresa quote coloring pages for yourself, share them with kiddos, a Bible Study, or a friend! Beautiful images for wonderful quotes! Thanks for sharing! I really, really, really enjoy these. 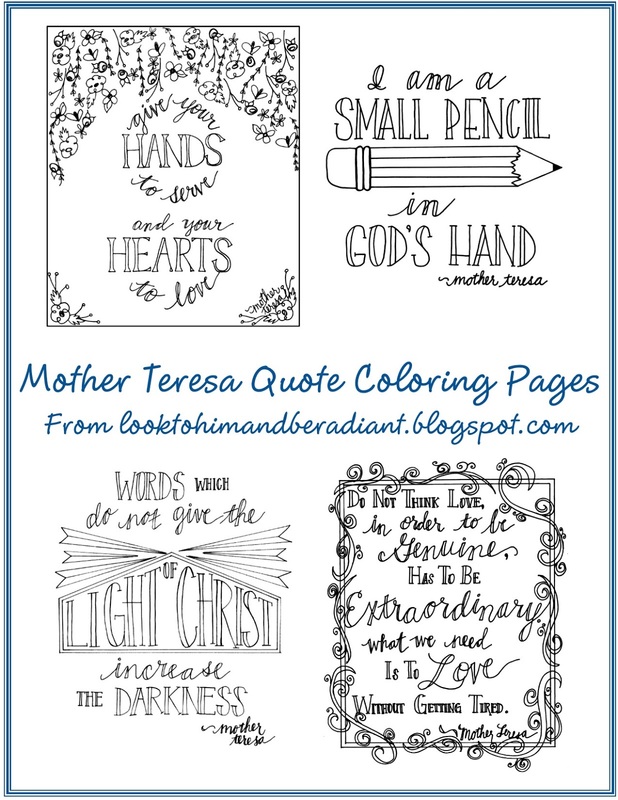 There are so many inspiring quotes by Mother Teresa...you could do all sorts of lovely coloring pages as prayer just from her words. Thank you for sharing! Thank you Alicia! I agree- so much wisdom from that tiny lady :). 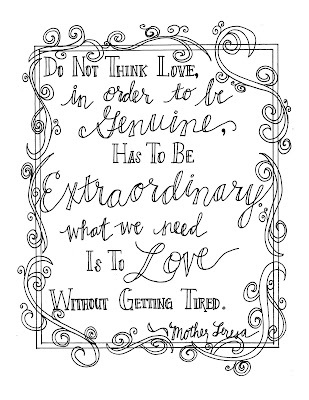 I'm planning more projects and activities for her upcoming canonization, and more quotes will definitely be in the mix. I think that these are my all-time favorite on your blog. 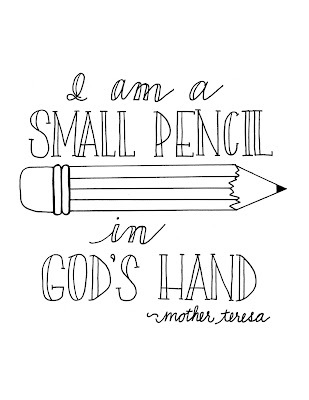 Don't know if its because Mother Teresa is a favorite or because they are simply adorable, maybe both. I'm so giddy with these, cant wait to see them colored in! Sep. 4th can't get here soon enough. These are beautiful! Thank you for sharing. These are great! Will be perfect for my Mother Theresa theme this Faith Formation year:-) Thank you!!! Thanks! I'm glad you like them! 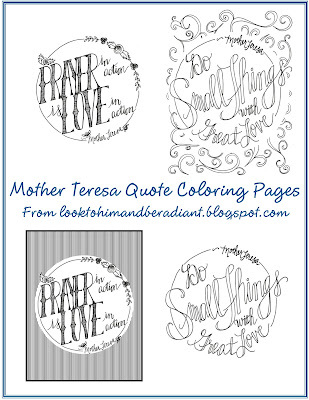 I'm doing a Mother Teresa theme too, so check back- I'll have more printables and resources soon! Your blog is AMAZING!!!! I love everything you create! I hope you do not mind if I use your creativity for the good of my students. Thanks for thinking of me! Yes, please link back to my Mother Teresa activities! I actually have a few more coloring pages posted right now, and I'll have a compilation of activities and printables posted tomorrow. Thank you for sharing them! How do you print them? Cannot get them to print page size without all the other information on blog page with it. 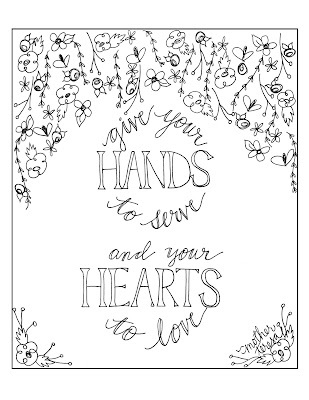 Click on the image for whatever coloring page you would like to print, it will open up in Google Drive as an 8.5x11 pdf, and then you should be able to print. Let me know if you have any more questions! These quotes are truly inspirational. Great list. Thanks. So cute! Thanks for these!